Absolutely stunning. I could not believe my eyes when I opened the box. It sparkled more so than it does in this picture. The stones are more translucent than they appear in the photo, but the color is awesome blue/purple as it should be. Thank you Stauers for an adfordavle Tanzanite ring with such beauty. I can't improve on Stunning! This ring is unbelievable. I've owned some spectacular high-dollar gemstones in my life and this ring will compete with any of them! I bought it as a gift -- and don't want to give it up! Good going, Stauer! My first order got lost in transit. When I reported it, Stauer immediately sent out another one. This ring is absolutely breath taking. I love Tanzanite and this ring did notdisappoint. It is indeed very stunning and I can't believe I'm wearing it already! My Mother's Day gift for myself. And I think it's worth my money. So elegant looking. This Karatu ring is very beautiful. I love it. I could even have a Karatu necklace if I wanted it but, there are NO Karatu EARRINGS! Still waiting for them! Since tanzanite is now one of the birthstone choices for December babies, I wanted to give my wife some tanzanite for her Dec. birthday. This was the most affordable piece I could find anywhere so I bought it, and she LOVES it! It has a simple beauty and elegance and looks so lovely on her finger. 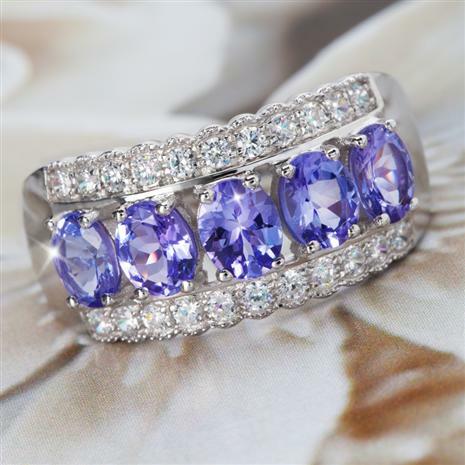 She is happy to have this great piece of tanzanite jewelry in her birthstone collection! Service by Stauer was great--only complaint was all the advertising they sent along with the ring. Nice ring, but my stones are dark lavender instead of blue. Loved this ring in the photo, and couldn't wait to wear it when it arrived. The color is good, only one stone is not quite as blue as the others. Overall, I am quite pleased with this ring. A great value, a beautiful ring for the money. I wish Stauer would design earrings to match. Huggie hoops would be great! As Great As The Picture! Just received this ring in the mail after ordering it for my wife on our anniversary. I have to say that the ring looks stunning in person as it does in the picture. I am more than happy with this, as is my wife ! I love blue, so I bought this for my beloved wife as a Christmas 2017 gift. She said she wants nothing for Christmas, but I think she will be overjoyed when she sees the beauty of these stones. I knew nothing about Tanzanite before, but am captivated by the colour, clarity, rarity and history of this gemstone. LOVE my tanzenite ring. Stauer had met and exceeded my expectations. I am a bit rough on Freeland this ring is very well made as well as beautiful. I received this ring yesterday and it took my breath away, it is so beautiful. I absolutely love it, it looks like a real expensive ring. I have small hands and it looks like it was made for my hand! Lol. I loved it so much, I ordered another ring from them. Also another nice thing is the shipping is fast. The Tanzanite is a gorgeous Blue/purple. You won’t go wrong ordering this amazing ring, and the price is fantastic. I don’t know what more you can say, THIS RING IS TOTALLY OUT OF THIS WORLD AWESOME!!!!!! My first purchase from Stauer - won't be my last. Have gotten many compliments on it. I have 2 other Tanz. rings, but this one for color, cut, clarity in a heavy, wide silver setting is No. 1!! The picture is good, but the real ring is not be believed , it is so Beautiful!!!! The Tanz. blue/purple is deep and better than the other 2 rings I have, that were much more expensive!! You will be amazed!!! For centuries, the “Big Four” — diamonds, rubies, emeralds and Sapphires — ruled the gem world. When tanzanite debuted in 1967, it was a sensation. Unlike those other stones, which are mined all over the world, tanzanite can be found in only one place on Earth: in the remote Merelani Hills in the shadow of Mt. Kilimanjaro in Tanzania, Africa. Gem of the century meets deal of the century. With its remarkable rarity and unique gemstone qualities. It's no wonder that experts have dubbed it, “the gemstone of the 20th century.” In recent years, top-quality tanzanite gems have fetched higher prices at auction than rubies, emeralds or diamonds! But because we buy direct and use our own designers, we are able to offer you this rare beauty at this exclusive Stauer price! What makes tanzanite so irresistible to jewelers and gem experts? Part of its appeal is the beautiful violet blue color. Tanzanite is also trichroic — which means that three different colors are visible when the stone is viewed from different angles. A gemstone found only one place on earth, means supply is extremely limited. Get your hands on the Karatu Tanzanite Ring before they're gone! Your satisfaction is 100% guaranteed. Experience the rare beauty of the Karatu Tanzanite Ring for two months. If you're not completely awestruck, simply send it back within 60 days for a complete refund of the sale price. We want you feel like you got the deal of the century!